Disappointingly, admission to the Alexander Hamilton museum was only $5. “You know this would be a lot cooler if you charged $10,” I told the lady working the front desk at this two-story stone house on the Nevis waterfront. She squinted and looked confused. “Because Hamilton is on the $10 bill,” I reminded her. She gave me a knowing little smirk. Nevisians know they have something special: a forgotten spot, maybe; an overlooked spot, definitely. They live on the most complete little island in the Caribbean, where history, relaxation, and tropical adventure balance within 36 square miles. It’s not the cheapest island to reach, and it’s not the cheapest vacation spot in the world once you arrive. But if you make the journey, you’ll find the best of what it means to visit the Caribbean. 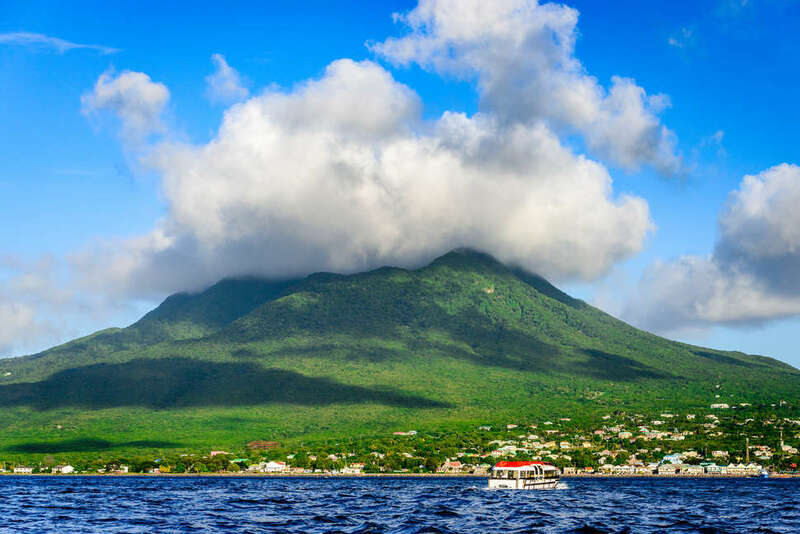 The name “Nevis” (pronounced NEE-vis) is derived from Nuestra Senora de las Nievas, meaning “Our Lady of the Snow.” Spanish explorers gave the island this name for the white cloud that often encircles Nevis Peak, the dormant volcano that’s the main geographic feature of the island. In the capital, Charlestown, the first thing you notice is how little of its development seems aimed at tourists. 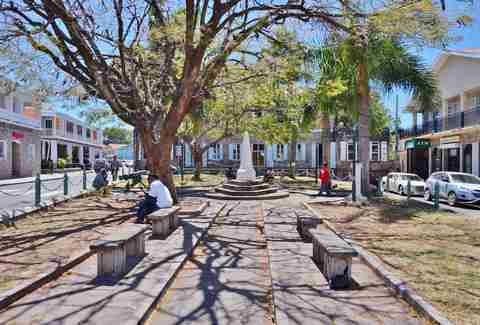 Downtown is a historic strip of stone buildings dating from the 17th century, with English colonial facades which have been painstakingly restored and maintained. Inside, they’re filled with pretty much every kind of business except tourist traps. The variety reflects the diversity of the local population: Jamaican groceries, Chinese restaurants, Guyanese markets to name a few. They sit in spaces where the sugar and slaves were once traded -- squint a little and you can almost see the horses clopping down the narrow streets now clogged with taxis. Pale-legged visitors toting cruise ship day-bags dot the sidewalks, here on afternoon excursions from the mega ships parked across The Narrows strait in St. Kitts. But they don’t overrun the place. And by 4pm, they’ll all be on the ferry back. In a week on the island, not a single local I spoke to said the place had changed much since Hamilton. Tell anyone you’re going to Nevis though, and you’ll need to mention Hamilton -- and probably St. Kitts -- before anyone has a clue where you’re headed. That anonymity only adds to the island’s charm. 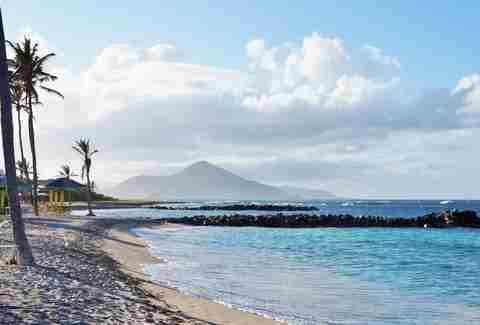 Since people forget Nevis exists, its world-class beaches have minimal crowds, making them arguably the most relaxing in the Caribbean. Sitting on the golden sand near the Chrishi Beach Club, you can see the cruise ships docked in St. Kitts, with battalions of tourists disembarking onto Reggae Beach and other hotspots. Nevis can accommodate ships with only a few hundred passengers, max. Beaches here aren’t the giant swaths of white sand you might find in nearby Anguilla, but they don’t need to accommodate nearly as many people. Oualie Beach, the first you’ll encounter after a ferry ride from St. Kitts, is an immediate oasis of empty sand and lounge chairs, in contrast to the throngs you had to deal with on the sister island. Nearby at Lovers Beach, a smattering of tourists sit reading on the sand, or gazing at the emerald mountains in the distance. Crucially, there is no almost no man-made noise -- if you closed your eyes, you’d think you were alone with the sea and the palm trees swaying in the breeze. 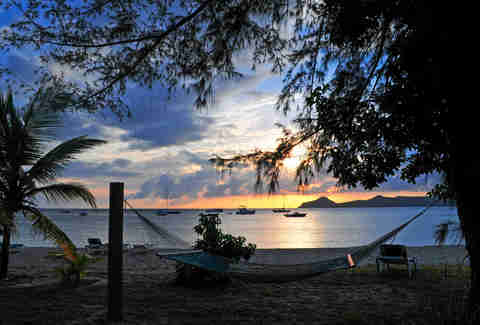 At Nisbet Beach, a lively bar and swimming pool sit aside a handful of hammocks as soft waves lap against the shore. On a weekend in late autumn, most of the hammocks are open, and the only sound you’ll hear is the occasional laughter of the bartender, sharing a joke with whoever has just pulled up for a drink. 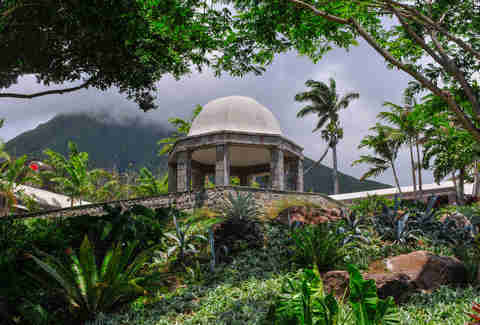 While much of the Caribbean is awash with luxury resorts and big name hotels, lodgings on Nevis keep a historic feel. 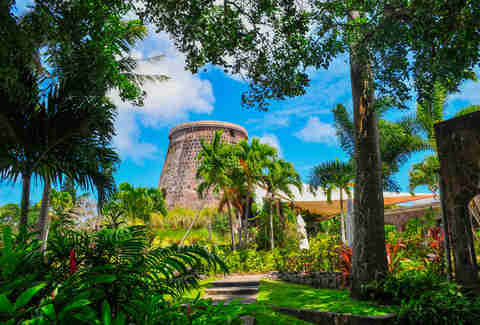 Most of the larger hotels are former sugar plantations (at one time Nevis had more than a hundred), where the main house has been converted into a grand lobby and restaurant. The old sugar mill at each site is repurposed, too -- at Montpelier it’s a private dining room, while at Golden Rock it takes the form of the honeymoon suite. 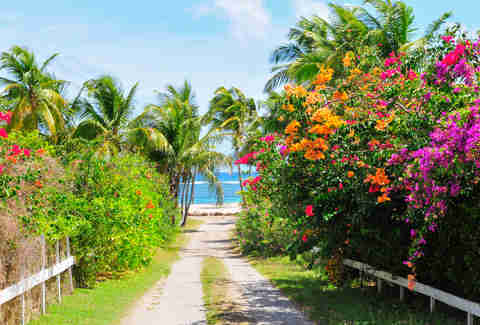 Nisbet Plantation is the only one set on the beach, but nearly all have private beaches with regular shuttles. If traditional luxury is more your speed, Nevis has a Four Seasons right on the water. If mealtimes are a highlight of your vacations, Nevis will feed you right. Scarf some curry or roti at Bananas with a sweeping view of the island. Or head to Sunshine’s and enjoy a mahi sandwich on the beach. Then give all those calories back to by clambering up dormant volcanoes or hiking to waterfalls in the rainforest. Nevis is like a better-groomed version of Dominica -- rough, rugged terrain, but with nicely paved roads and ropes along hiking trails. The quintessential trek is to the top of Nevis Peak, a challenging and rewarding 3,232-foot ascent that starts next to a penitentiary where you’ll see inmates tending gardens. Reaching the peak takes an hour or two of wending through banana plants and ferns, over boulders and up muddy cliffs. Unlike trails on more rustic islands, this one has convenient ropes to help along the way. A good guide will show you how to use them to make the climb as painless as possible. Once at the top, you’re rewarded with a sweeping 360-degree view of the islands St. Kitts and Montserrat on a clear day. It’s also the coldest place on the island, and the sweat you work up during the hike will make it frigid. Bring a jacket. The valleys and hills surrounding the volcano create a dewy, tropical rainforest below. Hikes here take you through the jungle to virginal waterfalls and streams. Some trails meander past four or five falls, and as the sound of one begins to die out the noise of another begins. Even your strenuous hike will feel soothing. If you’ve spent time in the Caribbean, you know the laid-back attitude can sometimes manifest itself as “island time,” where our American sense of punctuality just makes you feel uptight. Your sunrise tour ends up starting at 11am. Servers take a minute or 40 to attend to your table. Some people roll with it. Some people let slow water refills ruin their vacation. In Nevis, it doesn’t matter. It’s tranquilizingly laid-back, yes, but the people here want everyone to enjoy their time on the island. They understand that not all visitors are down with island time -- in my five days on Nevis, I got better service than I would back home in Miami. It didn’t matter whether it was in a dive bar like the Double Deuce, beach bars like Sunshine’s or Lime, or fine dining restaurants at the Montpelier and Golden Rock plantations. People were friendly, and everything ran on time. It was all the relaxation of the Caribbean, efficiently. All these factors add up to the same conclusion: Nevis should be on your mental map for a single-island Caribbean getaway. You’re sure to come away relaxed, but you can also feel the rush of a physical challenge, and maybe even learn something along the way. Or you can just slip into a vacation coma on the beach and OD on fruity drinks. Whatever your vision of the Caribbean, you’ll find it here. Unless you were hoping for an Alexander Hamilton theme park. Matt Meltzer is a contributing writer to Thrillist who’s actually never seen Hamilton. Follow him on Instagram @meltrez1.